When your pain is not relieved by usual medical care, physical therapy or other conservative management – or your pain is so severe that you can’t tolerate traditional care – then fluoroscopicaly guided interventional treatments may be the most effective and quickest way to stop the pain and start the healing process. Fluoroscopy is an imaging technique that allows a physician to quickly and easily view the internal structure and function of a patient in moving images. surgery. Frequently, they help prevent a condition from progressing onto a surgical situation. 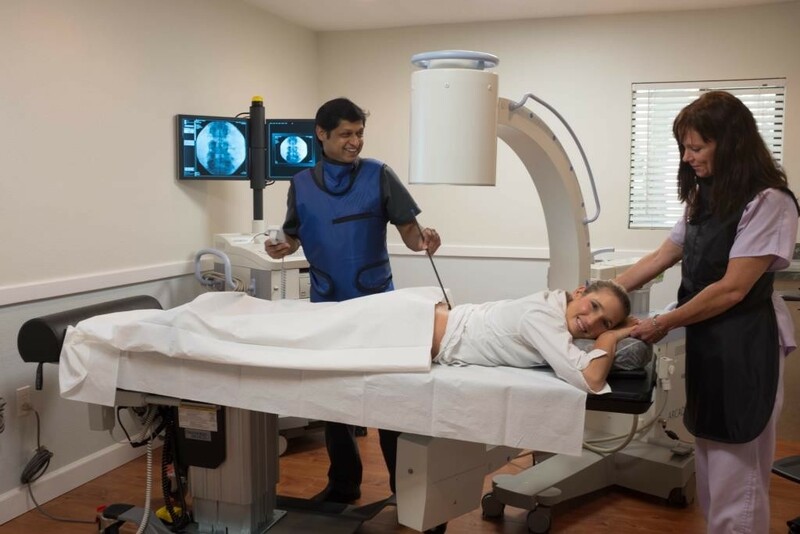 Interventional fluoroscopy is performed by Dr. Ranjit Gowda, MD in our state-of-the-art fluoroscopy suite, where we can provide expert and personal care to our patients in the comfort and convenience of our office. A spinal injection is an outpatient procedure that relieves pain by reducing inflammation that leads to swelling and irritation. These guided injections also help us identify the source of your pain. We customize each injection to meet our patients’ individual needs. With these brief procedures we provide local anesthetic to numb the skin before using a fluoroscope to precisely guide a needle and inject medicine to reduce your inflammation. We may ask you to relax on the day of the procedure, but you may typically resume normal daily activities the day after the injection. arthritis that has failed other conservative treatment, including those cases where surgery is not an option. An electrical current produced by specialized radio-wave equipment is used to heat up and deaden or deactivate certain small nerves that transmit or overwhelm the body with pain. Following RFA, a person is able to move and function better, in addition to enjoying chronic pain relief lasting longer than the usual ‘back injection’. RFA procedures are performed in our fluoroscopy suite as an outpatient and is both safe and well-tolerated. Is a Fluoroscopic Procedure Right for You?